Okay, so 2013 didn't quite turn into the "Year of the Kickstarter" we once imagined, as many high-profile releases were knocked back to 2014. That didn't mean a shortage of quality titles, however, each equally deserving of our attention. But which ones are deserving of the year's Aggie Award hardware? That is the question. We don't have an answer for you just yet (or rather, we do, but we want to drag out the suspense a while longer), but we are willing to narrow down the pool to our top five finalists in their respective categories. Speaking of Kickstarter, noticeable by their absence will be the two "broken" games. We're talking about Broken Age and Broken Sword, of course. Both of them arrived with a bang, but having been split into two, they remain unfinished to date. As impressed as we were by the games so far, it's not fair to judge them on the merits of only half a game. Ditto for The Wolf Among Us and The Walking Dead: Season Two, which have only teased us with promising first episodes so far. Conspicuous by their presence this year is an abundance of non-traditional adventure games. As developers continue to push the conventional envelope, we're being treated to an unprecedented level of new and creative ways of melding story, exploration, and puzzles (often in varying degrees). For every diehard adventurer whose head this causes to explode, there are many others re-embracing a genre that's daring to break out of the limited formats of yesteryear. There are still lots of classic-style releases contending as well, obviously. Just like the genre itself, there's room for both old- and new-school in our Aggie Award consideration. No matter what you think of our choices, you'll soon have the chance to vote on your own faves in our upcoming reader poll. The final Aggie Awards presentation will run from Wednesday to Friday, February 19-21, so don't wander off if you want to know which of the following games (listed in alphabetical order) are destined for bloated acceptance speeches. One of the core components of any adventure, the game’s narrative must engage the player’s interest and imagination. Entertaining in its own right, a good story also immerses the player in a believable game world and serves as motivation to overcome the challenges presented. While often accompanied by quality writing, the plot is a distinct feature that may or may not be ably supported by the actual dialogue. Gabriel Knight... Tex Murphy... April Ryan... Guybrush Threepwood. These names roll off the tongue of any adventure gamer as a testament to the importance of compelling protagonists in an adventure. But just as important are the villains, sidekicks, and significant supporting characters, which are often the juiciest parts. This category recognizes those who have made the most memorable contribution, regardless of role. Puzzles are an integral aspect of adventure gameplay, but not the only one. Good pacing, rich exploration, and variety of activities are all factors in player enjoyment as well, all suitably integrated into the storyline. The best games seek the right balance of these elements for the most rewarding gameplay experience. A somewhat ambiguous category meant to highlight any unusual, distinctive element. A creative concept can run the gamut from story premise to game mechanics, from stylistic choice to technical innovation. It doesn’t even need to have been successfully implemented, as it’s the idea itself that deserves the acknowledgement in a genre renowned for its conservative approach. Adventures can transport us to memorable places we’ve never been before, including those we never even imagined. Or perhaps to locales we’ve visited already, but never quite like this, making them feel fresh and new and awe-inspiring all over again. This category can refer to an overall game world or even a single environment in a given game so long as it’s a relevant location. If a picture is worth a thousand words, this category speaks volumes. Regardless of style, this award recognizes games that are not only visually attractive but stylistically distinctive. One look at a screenshot should elicit a “Wow!” followed by “Hey, that’s from…!” Includes both game world and character design, but not cinematics. From “bustling” city streets that look deserted to clouds that never move, animation is rarely a genre strong suit, often the victim of budget constraints. But richly animated adventures add so much to player immersion that any game that goes the extra mile in this area is deserving of appreciation. This category includes in-game character and ambient animations, plus cinematic cutscenes. As a complementary element playing in the background, often a game’s soundtrack is noticeable only when it becomes intrusive, but a strong score and attention to pacing can add so much to a game’s ambience. A catchy theme song can likewise make game music memorable, and an in-game musical number even more so. Whatever its particular strengths, the rare game that excels musically deserves its accolades. Often under-valued by publishers but never by gamers, quality voice acting can enhance a player’s investment in characters as surely as poor acting can ruin it. With so much international localization, voiceovers can be difficult to skillfully oversee, but any game benefits greatly from proper direction and believable acting. This category refers to the overall quality of vocal roles in a game, not to individual characters. As with music, sound effects are frequently given short shrift in adventures, but effective use of audio adds a vital layer of moody ambience. You may not be able to put your finger on the reason, but some games make you feel like you’re really there, and often the atmospheric sounds have drawn you in subconsciously. Some independent studios release their games commercially, but with no external publisher backing or secure distribution channels (at least at first). These self-published titles rarely get the attention (or sales) they often deserve, and the best of them merit a closer look from anyone who’s overlooked them to date. This list does not include games from companies fully established as publishers, even if they develop games internally. The home console and handheld platforms haven’t quite championed a genre resurgence like we once hoped they might, but there were still several quality titles released in the past year. To avoid duplication, the following includes only those games exclusive to non-PC platforms. Ports are not deemed to be original releases, and are therefore ineligible. For a genre that’s remained largely unchanged for decades, it’s actually got a rich history of experimental titles that push the creative envelope in unique, memorable ways. They don’t “evolve” or “redefine” adventures, but rather expand our understanding of what an adventure can we with their bold vision. Purists may resist, but this award honours those games that stretch beyond traditional genre conventions to offer something completely new, or at least present the familiar in imaginative new ways. Why mess with a good thing? While innovative adventures provide a welcome breath of fresh air, the lifeblood of the genre continues to be the many games that closely adhere to the comfortable, tried-and-true design formulas. Full of inventory and logic puzzles, memorable character dialogue, epic storylines and immersive exploration controlled with an intuitive point-and-click interface, they may not have changed much since Monkey Island and Myst, but they’re no less enjoyable when done well. No sneak peeks! A winner has already been decided, but we're not tipping our hand. Join us February 19-21 to find out! Can somone tell me how do you vote?! I’m new to the forums. If I remember correctly when the AG staff finishes their voting then we the readers will have a chance to vote for every category. Readers don’t vote on these. These picks are just our own finalists. The upcoming reader poll (next week) will let you vote for any game you want in each category. Pretty much the same 5 games nominated in all the categories? I’m not necessarily saying it is the wrong nominees, just that I would have expected a much greater variation between the different categories. 2013 might not have been the best year in the history of adventure games, but there were still plenty of good solid and for that matter unusual games, and I would have expected to see many of these at least as nominees in one or two category, like Oknytt for best setting just to give one example. Instead it seem like the Aggies are going to be divided between very few games, perhaps with one taking the vast majority, which as I see it isn’t a fair representation of the AG scene of 2013. We’re not going to punish the genre’s best games just for the sake of token representation of a few more. I’m glad to see a strong presence from Daedalic. The three games the studio released this year were of very high quality. Good representation from indie titles and great selections in the writing categories as well. I’m very interested in seeing who wins what! Beyond: Two Souls seems like a stellar contender in many areas. I don’t own a PS3 though so I can’t agree nor disagree on its plethora of nominations. Also, thank you for considering The Wolf Among Us and The Walking Dead: Season Two non-eligible this year. I’ve seem them pop up on some magazine’s awards (although I can’t remember which one) but they are hardly complete games at this point. You deserve a beer for this policy alone. Surprised “Face Noir” isn’t a nominee anywhere. I particularly think it deserves a nomination under “Best Soundtrack”—the jazzy, noir-influenced music is excellent. To me, 2013 marks the beginning of an era where game critics have finally reached their literary colleagues in that they are beginning to praise an art not for it’s sheer enjoyment but according to some convolved theory about what it should be. Just go at metacritic and take look at the difference between the “official critics” and the general public ratings for games such as Gone Home, Stanley’s Parable and Dear Esther. In the general public ratings, you’ll find some very low scores, (non-existent amongst the official critiques). If you take a moment to read those low-score reviews, you’ll find that, surprise! most of them recognized that those were original games, had a somewhat good concept but they were just bland, boring and mostly pompous. I have this awful feeling that the current nominees selection will make it so that Gone Home will get another game of the year award (why else include such a forgettable game in nearly each possible category?). Let it be said: Gone Home is no more than a cheap teen novel with oh so “shocking” and “provocative” undertones and marital ambiguity using a bland video game as it’s medium. Why else? Is that a trick question? Because a bunch of people on staff liked the game and strongly disagree with you. No need to fabricate imaginary reasons for why others don’t share your equally subjective opinion. Jackal: Agreed, my “why else” comment was a bit out of line. But what it implied is this feeling that the current list appears strongly biased towards Gone Home, as in: when we like something, let be careful not to give it undue credit just because it has our favour. Having that said, I also must concur that 2013 hasn’t been a great year for adventure games. 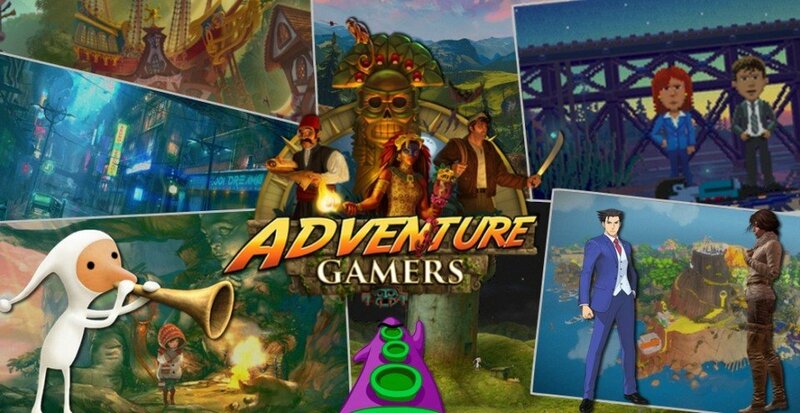 I personally would have included Antichamber and The Swapper in the nominees but I guess the story telling of those games might be a little thin to meet the “adventure game” criteria. Haven’t played Gone Home yet, seen some gameplay footage but I am interested why The Stanley Parable wasn’t nominated since it seems to me that both games rely on storytelling and exploration and not gameplay mechanics and puzzles? For me Stanley was one of the better adventure games this year but it is not recognized as such. Interested in knowing the reasons. A lot of us really liked The Stanley Parable, but there just really isn’t enough gameplay or player agency to warrant calling it an adventure. In Gone Home, at least you’re consciously trying to unravel a mystery through your actions (rummage through drawers, access cryptically-clued hidden passageways, etc.). Stanley Parable is more like a rat maze that you’re trying to find your way out of, full of narrator-guided amusing dead ends that send you back to the beginning. All you really do is choose which direction to go and then see what happens. Even the Stanley developer openly questions whether it’s actually a game. That’s part of its unique charm. But also why it’s not eligible for the Aggies. Thanks for the nomination! Just being in the same category as a game by Ron Gilbert is amazing. So why didn’t Heroine’s Quest qualify? It is rather odd that the AG review summary of Beyond says ‘....look past constraint and awkward gameplay’ and that the game is still nominated fir ‘best gameplay award’. I have not played it myself sofar, so I can’t really comment on this, but does that mean that 2013 was not a very rich year gameplay wise and that there simply wasn’t a better game on thus aspect? Thanks a lot for the nomination of ASA, it really is a pleasure and a good surprise. It would be fun to discuss of your reasons of putting ASA in the Sound Effects category. Antrax, Aggies are for commercial games only. As great as some freeware games are, there’s no way we could possibly play enough of them to be sure we were doing justice to them all. So no picking favourites, it has to be all or nothing. Subbi, if nothing else, it’s a reminder that a review is only one person’s opinion, while the Aggies represent us all. Simon, there’s no master plan for distributing nominations. ASA made the cut in the sound effects category and not in the others, simple as that. Ok, clear. I mistakenly assumed that also the reviews were checked by writer peers and editorial staff, making it a result of a much broader consensus. Lilly Looking Through is a great game of course ,but did this game really have ‘Soundtracks’ , .. uh, I mean Music !? .Anyhow, who I am I to complain . Its still sad how you couldn’t distinguish the differences between both; Soundtracks and Music. Where is Leisure Suit Larry in the Land of the Lounge Lizards: Reloaded on the nominee eligibility list? While I understand Broken Age and Broken Sword not being included because they are not completed, I wonder how Fester Mudd is included. The problems at Replay certainly played a role, but the developers still only delivered one (great) episode of a three-part opus. Shouldn’t Fester be held to the same standards as the Brokens were? I don’t understand why Papers Please is considered an adventure when The Stanley Parable is not. (I love both games, but that’s beside the point.) Papers Please has no exploration, no story to speak of, and no puzzles. The gameplay is of the kind you find in simulation games. Checking, comparing, deciding whether to let somebody enter the country or not. Could you please explain what made you decide Papers Please qualifies as an adventure? The stanley parable and gone home are both visual novels where you move around with minimal interaction and each lasted me almost exactly 2 hours. Eh, maybe this just wasnt a very good year for adventures. Oh well. AGF, we don’t consider ports or remakes for awards. rtrooney, Fester Mudd is sold as a standalone game (even if it’s meant to be episodic); the others are not. Karlok, I haven’t played Papers, Please, so my personal knowledge is limited, but by staff accounts, the entire game is based on puzzle-solving (or at least problem-solving) within a narrative framework, so it qualifies. There’s certainly far more player agency involved than in Stanley. I’m not about to start getting into debates on what constitutes a puzzle or a story. The endless “what is an adventure?” foolishness (in general, not from you) is tiresome enough. Stick it to the Man was the most fun I had with an adventure I reckon this year. Thought it would have got a look-in; it was every bit as adventure-gamey as the Telltale stuff. I thought Leisure Suit Larry was also very funny, but that comedy thing really is subjective I guess. Contrast too felt adventure-y enough to get a look-in. So how come Memoria hasn’t made the best story category? Apart from Beyond (which I haven’t played… yet), Memoria has far and wide the better story of all the other games listed. Beyond: Two souls best gameplay? Is this some kind of joke? We covered Antichamber. And calling it Portal without the story explains why we consider one an adventure and the other not.